Shanghai, China, September 1, 2016 /ChinaNewswire.com/ - Twenty years ago, brands could take their time to craft a brand with Chinese consumers. But today, the Internet compels companies to use faster techniques to build brands, engage influencers, and put out social media fires. And the cornerstone focus for companies should be on effective brand storytelling. 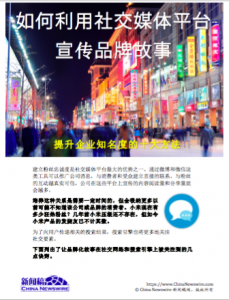 In the Chinese-language White Paper "How To Boost Your Brand Storytelling Across Social Media", issued by China Newswire today, ten key components of brand storytelling are related with effective uses on Chinese social media, such as Weibo and WeChat, as well as interactions with journalists, bloggers, influencers and media writers in China. "Social media measurement combined with a keen understanding of the social media landscape helps domestic and foreign companies engage with target consumers," says Rose Gao, director of media outreach at China Newswire. "Our White Paper 'How To Boost Your Brand Storytelling Across Social Media' gives corporate executives simple and immediately usable methods to master online tools and to commute effectively with stakeholders." As everyone in China already knows, social media is the best way to stay in touch with friends, find deals from favorite brands, and pay for services with connected bank cards. Weibo's microblog monthly active users in June 2016 grew 33% year over year to 282 million, according to Weibo Corporation's latest financial report. And over 700 million people use Tencent's WeChat mobile messaging app. Famous brands are participating in the social media ecosystem too, as the interactions between consumers and products provides higher revenue acquisition capabilities. But with all this opportunity on China's Internet also comes risks for companies of all sizes to participate in social media. The Internet doesn't go to sleep at night, so companies need to have proactive 24/7 management of their social media personas. The fundamental component of the social media persona is the brand storytelling component. With a journalist database of over 30,000 records and a operational history for over 10 years, China Newswire is the leading press release distribution and content marketing platform in Greater China. Covering dozens of topics, including technology, finance, corporate social responsibility, transportation, travel, and education, China Newswire supports companies around the world to elevate their online visibility among Chinese media and to support Chinese brands who are elevating their visibility outside of China. With cutting-edge dashboard reports, superior client services, and a fundamental ability to help companies expand their social media reach, China Newswire is the leader in content marketing. More information at https://www.chinanewswire.com.